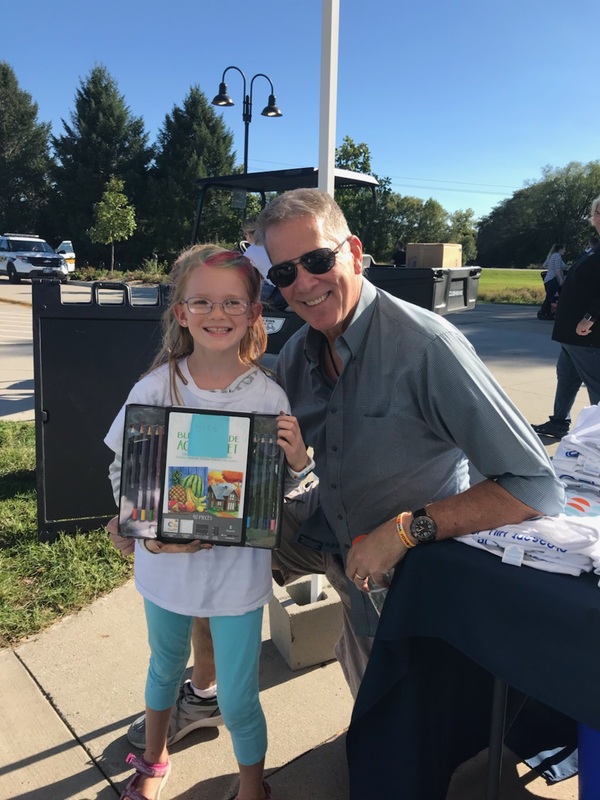 When: September 21, 2019 11:00 a.m. to 5:00 p.m.
Art on the Lake is excited to announce the 4th annual Art on the Lake Festival which will take place on Saturday, September 21, 2019! The Art on the Lake Festival is held at Copper Creek Lake Park in Pleasant Hill, Iowa. The festival is a family-friendly event that is free to the community and features music by local musicians, food from local vendors, interactive kids’ crafts in Lil’ Artist Alley, and showcases over 50 artists. Art on the Lake Festival aims to promote and foster interest and participation in the arts among all members of the community. By raising awareness of local artists by providing a free opportunity to exhibit and market their work and encouraging the arts with a positive learning experience for all ages in the community. Providing Eastern Polk County, an under served Arts and Cultural community, a high quality Arts and Cultural experience. Important Festival Information Show Location: Copper Creek Lake Park, Pleasant Hill, IA 4390 E. University Avenue, Pleasant Hill, IA 50327 Important Dates and Deadlines: NOW ACCEPTING APPLICATIONS Deadline to Apply: June 21, 2019 Notification of Invitation: July 9, 2019 Accept Invitation: July 15, 2019 Entry: Along with the completion of this application, each applicant must submit four (4) current images of their work. Please do not provide thumbnail images. It is very important that the digital images show the proportions of the work. The images provided do not have to be of pieces that will be in your booth but need to be representative of the work you will show. Digital images will be used during the jury process and on our website or Facebook Page for marketing. Jury Process: Approximately 50 booth spaces will be available. Applicants will be selected on the basis of quality and uniqueness of work, NOT on a first-come, first-served basis. The jury evaluation is scheduled for June 28, 2019. The evaluation is conducted by a panel of experienced arts industry professionals and is based solely upon the quality of work as illustrated in submitted digital images. Images are viewed simultaneously. The jury will select a balanced show; however, there are no quotas. Award recipients from the previous year are invited to participate and are exempt from jury evaluation process. The balance of the show will be selected by the jury. The integrity of the jury panel review process is paramount to our credibility among artists and to our larger success in the community. Acceptance: Artists will be notified of their invitation via email, no later than July 9, 2019. Artists who are invited to participate must accept their invitation via email, no later than July 15, 2019. All decisions made by the jury are final. Wait List: A wait list will be maintained. Wait listed artists can be accepted up to the day of the Festival depending upon space available. What Are the Fees: Art on the Lake Festival aims to promote and foster interest and participation in the arts among all members of the community. Art on the Lake Festival provides artists a free opportunity to exhibit and market their work. There is no Fee to participate, however a REFUNDABLE deposit of $30.00 is required if the artist is accepted into the show. The deposit will be refunded upon arrival the morning of the festival. Cancellations and Refunds: CANCELLATION MUST BE RECEIVED VIA EMAIL BY September 13, 2019. The refundable deposit will NOT be refunded to any artist who cancels after this date. Any artist who does not give any notification will not be invited to participate in any future events or have their deposit returned. Festival Rules and Regulations •	Exhibitor is responsible for setting up their tent, display, supervising and maintaining the space provided throughout the duration of the event and breaking it down before leaving the event. •	Only handmade items by you will be allowed. Commercially made items for resale will not be allowed. If we find you have commercially made items, you will be asked to remove those items or tear down immediately. You will not be invited back to participate in future events. •	All exhibits must be in place and staffed no later than 10:30 am prior to the event opening to the public at 11:00 am. •	Exhibits must be open and staffed during all event hours. Booth sitters will be available during the event. •	Exhibitor agrees to confine all display and selling activity within the assigned booth spaces only (10’x10’), refraining from the placing of signs, goods or other materials within or over public right-of-way spaces. •	Exhibitor understands trailers will not be permitted on the trail without prior consent. •	All tents must be staked or weighted. •	Exhibitor agrees to abide by all applicable laws, ordinances and regulations pertaining to health, fire prevention, public safety, business licenses and sales tax permits. •	Exhibitor agrees to maintain the dignity and integrity of the event. Art on the Lake reserves the right to ask any exhibitor who they feel is not acting in the best interest of the event to leave the premises. •	Exhibitor agrees to be respectful, courteous, and professional. •	All exhibit structures and debris must be removed in a timely manner after the close of the event. A team is two or more artists who collaborate to produce one body finished artwork. Please list all artists names if you are applying as a team. Please limit to 3-5 sentences. If demonstrating, please describe what you will be doing briefly. You must email 4 images to complete your application. Incomplete applications will not be accepted. I will email 4 images of my work with my name to info@artonthelakefestival.com to complete the application. Event participants agree to allow the images included with their application to be used for publicity and advertising. All work must be original and creative. Kits, commercial molds, factory or machine produced items will not be juried into the event. One flip bin of commercially printed reproductions will be allowed. The bin must be labeled. No reproductions will be allowed to hang. One artist allowed per booth unless work is collaborative. All spaces are approximately 10’ wide by 10’ deep in an open outdoor area. All participating artists must have a tent, furnish tables, chairs and any set-up items. The Festival is an outdoor show, please be prepared in the event of inclement weather, including wind. There is no rain date scheduled. Art on the Lake Festival provides artists a free opportunity to exhibit and market their work. There is no Fee to participate, however a REFUNDABLE deposit of $30.00 is required if the artist is accepted into the show. The deposit will be refunded upon arrival the morning of the festival. CANCELLATION MUST BE RECEIVED VIA EMAIL BY September 13, 2019. The refundable deposit will NOT be refunded to any artist who cancels after this date. Any artist who does not give any notification will not be invited to participate in any future events or have their deposit returned. It is each vendor's responsibility to know if they are required to collect and remit Iowa Sales Tax. Art on the Lake does not accept responsibility for vendors who fail to meet this obligation. Vendors who are required to remit sales tax must have a valid Sales Tax Permit. For questions about sales tax, please contact the Iowa Department of Revenue and Finance. I HAVE READ, UNDERSTAND, AND AGREE TO THE POLICIES AS STATED ABOVE. IN CONSIDERATION for being permitted to participate in the Art on the Lake event, the PARTICIPANT DOES HEREBY: 1. RELEASE, WAIVE, DISCHARGE AND COVENANT NOT TO SUE the Released Parties and their successors and assigns from any and all liability, damages, losses, claims and demands which the Participant or his or her heirs, assigns, or legal representatives may have or which may hereinafter accrue with respect to the Participant’s bodily injury, personal injury, illness, death or property damage which arises or may hereafter arise, whether caused wholly or in part by the negligence or other misconduct of the Released Parties. 2. ASSUME FULL RESPONSIBILITY FOR AND RISK OF BODILY INJURY, DEATH OR PROPERTY DAMAGE due to the negligence of the Released Parties or otherwise while participating in the event. 3. AGREE TO INDEMNIFY AND HOLD HARMLESS the Released Parties and each of them from any loss, liability, damage, or cost (including attorney’s fees) they may incur due to the negligence or other misconduct of the Participant at the event. 4. UNDERSTAND AND ACKNOWLEGE that the Released Parties have not provided any accident or health insurance for the Participant’s benefit, and do not assume any responsibility for or obligation to provide such insurance coverage. Each Participant is expected and encouraged to obtain his or her own health, medical, travel, disability or other insurance coverage. 5. ACKNOWLEDGE THE AUTHORITY TO BE REMOVED from the event at the will and discretion of Nora Schatzberg. 6. ALLOW THE USE OF FILM OR PHOTOGRAPHS taken during the course event that may illustrate the Participant or the Participant’s property to be used for advertising and promotional purposes in any medium, without compensation to the Participant. This provision is NOT intended to infringe upon the ownership or intellectual property rights of artists or exhibitors. THE PARTICIPANT expressly acknowledges and agrees that the foregoing release, waiver, and indemnity agreement is intended to be as broad and inclusive as is permitted by law in the State of Iowa, and that if any portion thereof is held invalid, it is agreed that the balance shall, notwithstanding, continue in full legal force and effect. Thank you! You have submitted you application. Please Email images to info@artonthelakefestival.com to complete your application. Artists will be notified via email if you are accepted into the 2019 Art on the Lake Festival by July 9th, 2019. Email questions to info@artonthelakefestival.com or call (515)957-1180.